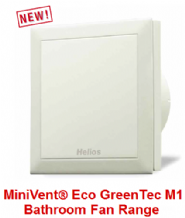 The new Helios MiniVent® M1 Eco fan range achieve high pressure capacity, maximum energy efficiency and are extremely quiet. Two speeds, protection to IP X5 (suitable for all zones of the bathroom except zone 0 see (building regulations) & high quality long term ball bearings are standard features. Due to Helios UltraSilence® technology the Minivent® operates almost silently & uses approximately one third less energy than conventional small fans. 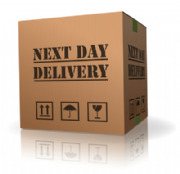 Available in two sizes; 100mm and 120mm. These attractive 100 mm extract fans offer a volume of up to 25 l/s and a sound level of 28 dB(a). They can be wall or ceiling mounting and are energy efficient consuming only 9 Watts. The M1/100 fan is a 2 speed fan as standard. Draught proof when not operational. These attractive 100 mm extract fans offer a volume of up to 25 l/s and a sound level of 28 dB(a) with both a run on timer and a interval timer. They can be wall or ceiling mounting and are energy efficient consuming only 9 Watts. The M1/100 fan is a 2 speed fan as standard. Designed to be light switch operated with a set run on time. Draught proof when not operational. These attractive 100 mm humidistat extract fans offer a volume of up to 25 l/s and a sound level of 28 dB(a) with an automatic humidity sensor. They can be wall or ceiling mounting and are energy efficient consuming only 9 Watts. The M1/100 fan is a 2 speed fan as standard. Draught proof when not operational. These attractive 100 mm extract fans offer a volume of up to 25 l/s and a sound level of 28 dB(a) with an automatic movement sensor - PIR. They can be wall or ceiling mounting and are energy efficient consuming only 9 Watts. The M1/100 fan is a 2 speed fan as standard. Draught proof when not operational. These attractive 120 mm extract fans offer a volume of up to 47 l/s and a sound level of 28 dB(a) with a run timer and interval timer. They can be wall or ceiling mounting and are energy efficient consuming only 13 Watts. The M1/120 fan is a 2 speed fan as standard. Designed to be light switch operated with a set run on time. Draught proof when not operational. These attractive 120 mm extract fans offer a volume of up to 47 l/s and a sound level of 28 dB(A) with intelligent humidity sensor. They can be wall or ceiling mounting and are energy efficient consuming only 13 Watts. The M1/120 fan is a 2 speed fan as standard. Draught proof when not operational. These attractive 120 mm extract fans offer a volume of up to 47 l/s and a sound level of 28 dB(a) with an automatic movement sensor - PIR. They can be wall or ceiling mounting and are energy efficient consuming only 13 Watts. The M1/120 fan is a 2 speed fan as standard. Draught proof.